Five posts ago I referenced a Thomas Friedman article from the New York Times about how to get hired at Google. I recently came across this post by Gary Burnison that says Mr. Friedman didn't mention that those same 5 traits can get you a job anywhere! 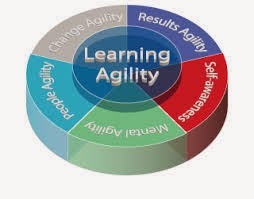 In particular Mr. Burnison's article talks about the importance of Learning Agility. No doubt the traditional disciplines lend themselves to developing mental agility. But to develop the other four, the learning environment must be rich in the 8 Conditions. Belonging and Heroes are necessary for people agility and self-awareness. Sense of Accomplishment also makes an important contribution to self-awareness as a student's effort and perseverance are noted and celebrated. Curiosity & Creativity supports change agility and Spirit of Adventure fosters both change and results agility in so far as they benefit from experimentation and the courage to act in first time situations. And Leadership & Responsibility and Confidence to Take Action are all about delivering results. Notice, too, the importance to learning agility of the ability to "learn from experience" and to "apply". These are not things that can done reading textbooks or even, perhaps, in a classroom. If we are to develop the skills necessary to be life-long, hireable-by-anyone learners, then the traditional approaches must give way to much more flexible ones rooted in student voice and our students' real world experiences.